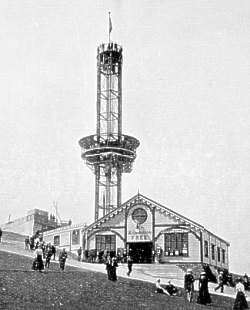 Erected in 1899 - a 150ft iron tower with a revolving observatory platform capable of seating 200. Named after Thomas Warwick, a London engineer, who obtained the UK concession for this American design. A steam powered lift took visitors up to the platform. Badly damaged in a fire in August 1900 which destroyed the surrounding buildings the tower survived being turned into a 'whirlygig' with boats suspended on long chains. However another fire in 1906 finally killed it off and it was demolished in March 1907.